An OTC transaction in which an investor takes a view on the realized variance of some instrument, usually an index, over a specified time period. However observations are only counted toward the valuation if the underlying level the previous day satisfies some “condition”. Exactly the same as a variance swap except for an agreed condition. However observations are only counted toward the valuation if the underlying level the previous day satisfies some condition. An up-var and a down-var swap with the same trigger equate to a normal variance swap. To get exposure to volatility with directional overlay. Were created in the Autumn of 2006 to increase popularity of an already popular trading tool in the standard variance swaps. Hedge Funds are by far the most active clients for variance swaps. The payout is linear to variance rather than volatility. Therefore, the payout will rise at a higher rate than volatility. All the hedging is performed by the provider, saving time and money. Losses are limited, however gains are magnified. 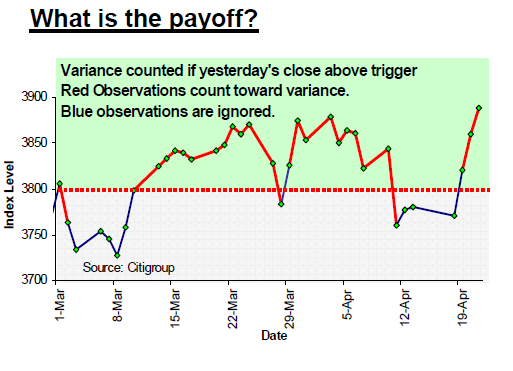 Payoffs can be reduced depending on the number of observations that satisfy the condition. This is a more significant risk when the conditional variance swap is used to hedge some other position. More risk for the market marker who would find it harder to hedge when near the trigger as it would be equally likely for it to move above (hedging) or move below (no hedging).